Baroque Tempo Research: I am currently expanding on my completed doctoral research which focussed narrowly on tempo in the organ music of Matthias Weckmann. I am now working to increase the scope of my original research so that my theories will also be able to explain the idiosyncrasies of tempo notation in the works of other organ composers, such as Buxtehude, Bruhns, Böhm and J.S. Bach. I am developing theories via treatise examination, manuscript analysis and a further interrogation of the results of this study through the practical application of my theories directly on the organ. Conference Presentation at the 16th Biennial International Conference on Baroque Music, July 9-13, Salzburg Mozarteum. Presentation topic: Tempo changes in early Baroque organ music. The subject was based on my doctoral research (see below). Please click on the ICBM link below for more details. Doctoral Thesis and Lecture Recital - January 24, 2014. Eglise Immaculé-Conception, Montréal, Canada. 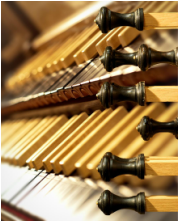 My topic for my lecture-recital focussed on tactus and tempo issues in seventeenth-century organ music, using specific samples of Matthias Weckmann's organ music to illustrate certain principles. Presentation of my work on musical rhetoric in Sweelinck's sacred organ variations. For the website of this conference, please click the link 'ICHKM website' below; for the abstract of my paper - "Musical Rhetoric in Sweelinck's Sacred Keyboard Variations" - please click on the link 'Abstract'.